ComeOn Asian Handicap betting is probably the best in the market. The odds are good and it offers a variety of Asian handicap types for you to choose while betting. ComeOn allows its users to bet on a number of sports football being one of them. 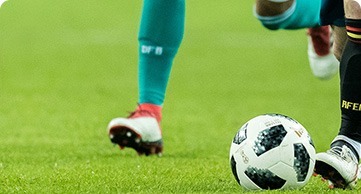 The betting company offers its odds just above the average and offers them for most of the major leagues around the world such as the English Premier League, Bundesliga and many more. The Asian handicap lines offered by the site allow for the odds to be the same for both the home and away team. The odds when betting with this form are lucrative most times, especially on football games. The Asian handicap lines make the betting opportunities very competitive. What is the selection of Asian Handicap bets at ComeOn? The bookie offers a number of Asian Handicap Betting Selections for their users. Some of these selections are Over/Under betting. This is a type of betting where you predict the number of goals that will be scored in a football match. For instance, betting on Under 1.5 means, you think the match will finish with less than 2 goals being scored and over betting 1.5 means you think the match will end with 2 goals or more being scored. That is not all, ComeOn also offers other selections of betting such as 3-way handicap, goal scorers, first to score or last to score, totals and more. ComeOn gives you a variety and the chance to try your best at winning. The other selections are pretty self-explanatory, so you decide which one you feel like you’d make the most money out of. What are the Asian Handicap betting odds at ComeOn? The odds for very match tend to differ depending on who’s playing. The odds always tend to favour the underdogs on the normal betting styles. This works differently with the Asian handicaps because the handicaps placed on the teams are meant to help even them out. It is also good for you as a person placing the bet because you are safeguarded albeit very slightly. It has to be mentioned that the odds placed by the bookmakers in ComeOn are very competitive giving you a good rate and also a good chance for a higher payout. At ComeOn, you get competitive betting opportunities, especially when using the Asian handicap betting system because of the handicaps that assist in placing similar odds on both sides of the game. Does ComeOn provide Asian Handicap bets at Live Betting? The Live Betting on ComeOn is packed with a number of football competitions with almost perfect coverage. The more popular leagues tend to get more coverage, but the firm has tried its best to ensure that even the lesser leagues have a chance. Asian handicap bets are offered on ComeOn when a person decides to go on live betting. It has to be noted though that the propositions will be different from those available on pre-match bets. For instance, the bets will be settled by score for the rest of the game from the point the bet was set. Scored goals before would be viewed as superfluous to the bet. Although it’s possible to place Asian handicap bets on live betting do not expect many betting opportunities with each match. ComeOn offers different kinds of bets on its sites and it might prove to be difficult as a first time user on the site to know which football matches use Asian handicaps and which ones do not. In order for you to know this, you need to know some of the abbreviations used in this type of betting. For instance, a football match with AH would mean that it uses the Asian Handicap betting system, U/O means it’s an Under or Over betting used on that football match. The best thing for you to do would be to know these abbreviations because they can guide you when placing your bets. Are there any special rules for betting with Asian Handicap at ComeOn? If a match is played before the date denoted for kick off then the bets will stand. This is on the condition that the bet was not made later than the new kick off time. If the venue from a match is changed. The bets will remain void as long as the designation for home and away team has not changed. In order to place a bet with the site, you need to make sure that you are a member of the site. The first step would be to sign up to the site and provide all the relevant information that they ask for. The next thing would be to deposit some money into the site. Once that is done click on the sports section on the site. Select football and view the matches that are about to take place and the ones that will take place in the future. Click on the team that you’d like to place your bet on, select the type of betting system that you’d like to use ( Asian handicap in this case). Input the amount of money you’d like to wager and all other relevant details. That’s it you’ve placed a bet with the site.